I wanted to come to Washington, D.C., to visit my friend, M. I intended to come last weekend but didn’t because of the forecasted snow storm. My teen wanted to come, but I rescheduled the trip for this weekend and she had school… so I thought… what if we made it a social justice tour in honor of Martin Luther King Jr.
We ended up on the campus of Georgetown University’s Law Center. And had a sandwich nearby where I tried my first pastrami. I don’t know why I never had pastrami before. We then attended a rally for Marzieh Hashemi, the African-American journalist and American citizen who lives in Iran and works for the English language Iranian Press. She is also a Muslim convert. Marzieh recently came home to the United States to visit family when she found herself “kidnapped” by the FBI and transferred to two different detention facilities, where she was not offered halal food nor allowed to wear her hijab. I had heard Marzieh’s story on NPR’s Morning Edition and saw M posting some updates on her situation on Facebook. When he mentioned a rally and protest today, I wanted to go. She called her 11-day imprisonment an act of “intimidation” and encouraged all of us to make sure we make a difference with our lives because we will all eventually die. Meanwhile, my daughter ended up on Iranian TV. See the little blue globe in the photo and the brown haired girl in the jean jacket? That’s my baby. This is the final week to see Lalla Essaydi’s photographs at the Williams Center for the Arts gallery at Lafayette College. This seven photograph exhibit takes a journey into contemporary Muslim women’s space while exploring traditional Orientalist beliefs, otherwise known as Western stereotypes of the Muslim/Arab experience. Immediately, I recognized these themes in Essaydi’s photography. My previous exposure both academically (my interest in post colonial Francophone Africa, how it intersects with the Muslim world, and the impact these topics have on contemporary international politics) and via travel in Africa and the Middle East came rushing into my head like a lost dream you fight to remember upon waking. This exhibit features five photographs that use white/beige colors, Arabic writing, henna and women in various levels of religious covering and two photographs more steeped in color. The seven photographs come from three different series: Converging Territories, Harem and Bullets. Just reading those titles should leave a certain taste in the mouth. I have with me an exhibit guide but I haven’t referred to it yet as I prefer to digest the works on my own first. The first piece one encounters in the exhibit is 2004’s Converging Territories #24, featuring a woman’s face, only eyes showing, with writing on her face and the cloth covering her. The chromogenic print mounted on aluminum divides the woman’s face into four panels, each an almost even display of skin, lettering, and beige fabric. This one did not attract or impress me. That is not to say it does not present a strong harmonious image. It is certainly a lovely piece of artwork, but artwork often speaks to the viewer in unique ways and this one seemed what one would expect from an exhibit like this. Next came Harem #2 (2009). Instantly, I noticed the use of the term harem and the mimicry of traditional Orientalist images prevalent in I believe it was 19th century Western paintings capturing a fantasy of what Western/European artists expected the Muslim/Arab lifestyle to be. The Harem series uses more color, more texture, and repeats the Orientalist themes of a reclining woman in exotic dress. 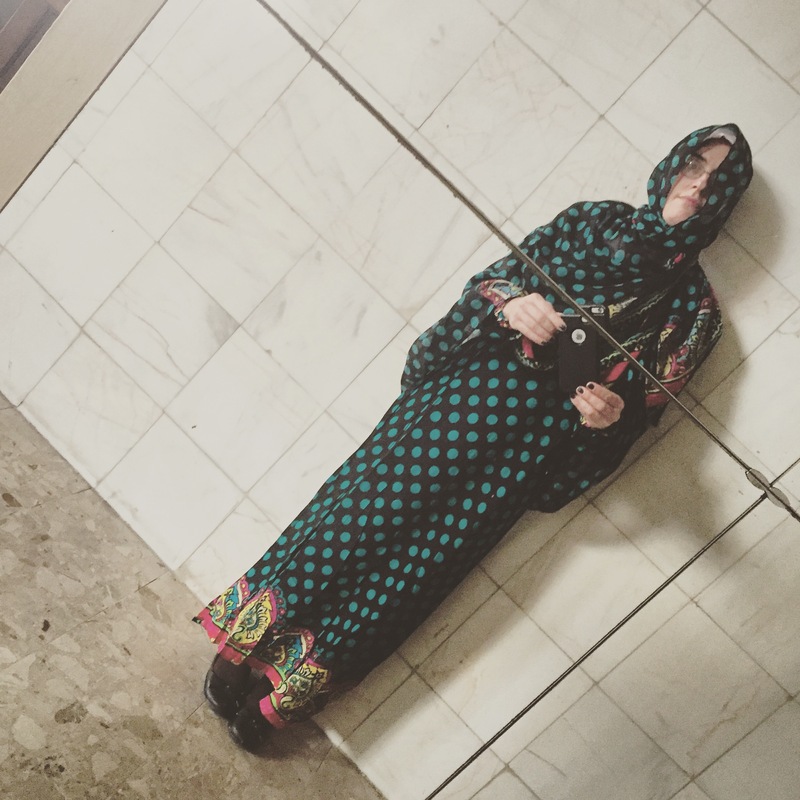 The repetition of these stereotypical themes used by a Muslim female photography made me bristle. But this woman is propped on one arm and seated rather proudly so I sense the challenge to the age-old idea of the Middle Eastern harem. Next, I found Bullets #3 (2003). The woman in this photograph has a sassy shoulder turned to the camera. She is covered, but showing more flesh than normally proper throughout the arm. The backdrop is all bullets as if they were tiles on the wall, bullets also adorn her clothes. Another stunning photograph, but frankly I grow tired of the constant obsession of the Muslim identity automatically connecting with terrorism. I’m sure that’s Essaydi’s point, too. I’m going to skip my favorite piece and turn instead to Harem Revisited #34 (2012). Perhaps this is the most colorful piece presented at Lafayette. It is three years newer than the other, and the woman’s pose in this one is not only more docile and reclined but divided into three panels, an immediate detraction from her humanity. She is reduced to pieces. But the focal point of the exhibit (and my favorite), if I can proclaim that based on not only the fact that it was in my opinion very prominently displayed, is Converging Territories #30 (2004). [Featured image for this post.] It depicts, with the same beige clothing on beige background covered with writing and people decorated with henna, four females standing side by side in various levels of garb. The largest woman, whom appears to be the only adult in the group, is completely covered head to toe. I can’t even refer to it as burqa as she doesn’t even have a slit or a screen for her eyes. I see them as a family, and the next one is in more traditional burqa and appears to be an adolescent. The next girl, a sweet looking pre-teen, has her scarf tied under her chin, exposing her whole face but not her hair. The last little girl has no head covering. What I adore about this photograph is the vivid use of the progression of covering as it follows a woman through various stages of life and suggests not only the typical message of how a woman’s identity is limited by strict forms of covering, but also attaches this idea to the act of mothering and potentially makes it more universal. To me, the suggestion is that all women lose a part of their identity as they transition into a maternal role. This has nothing to do with religion. If you miss the exhibit at Lafayette, a similar exhibit runs through May at the Trout Gallery of Dickinson College. About Lalla Essaydi: According to the exhibit guide, she grew up in Morocco, raised her family in Saudi Arabia, and lived in both France and the United States. She received her arts education from prestigious art programs in both France and the United States. There’s a dress I want, but every time I step into the women’s shop, surrounded by women, a man from the street dives toward me to help me with the purchase. He will then receive a commission from the shopkeeper and it aggravates me because I only receive this treatment because I am white. I bought two dresses, from two different shops today, with a unwanted helper, but paid 2500 Dj Francs. That’s about $13.50. It’s also what I paid for my dinner last night at the sit-down restaurant of high quality. The dress I want comes with the headscarf and my first helper wanted me to pay 5,000 Djiboutian Francs. I returned later, hadn’t even expressed interest in the dress when a different man swooped in upon me while a woman insisted on trying to sell us incense. Today M and I started out early and wove through the side streets and alleys of the market to sneak into my shop from behind. We did it. Walked up to the counter and asked for my dress. An older Djiboutian woman in a mountain of colorful textiles leaned over and pinched the fabric as I held it. She nodded her approval. And so I bought it. For 1800 Dj Fr. About $10. With the scarf. And to think I paid 2500 yesterday. The afternoon passed quickly. Any piece of Parisian real estate needs to capitalize on space, so you experience many spiral staircases. I’ve already had at least one friend picture me falling down them. And breaking something. Or many things. We headed up to Barbès and out the metro to Couronnes. I am looking for a more effective way to prepare my hijab. There’s a lot of Muslim shops in that neighborhood, but before we even got too far I noticed a bakery that suited my fancy. This bakery had a raspberry tart that looked appealing. As I perused the case, the contents just got better. I decided on a chocolate bread and impulse bought a raspberry and also a pistachio scone. They were 50 cents each. And they were scrumptious. I spent 3.50 Euros for a Diet Coke, the bread and the macaroons. It was all truly delectable. Then we stopped in a women’s Muslim dress shop. I wanted some sort of secure underscarf so if my scarf moved I would still be covered. In Africa, I want to find some kind of niqab/dress. M encouraged me to converse with the shop owner in French. She had some lovely scarfs and even walked me through her dress selection. But when I mentioned I wanted a head covering that didn’t move, she showed me the bonnet.I fell in love with the pink one because it matches the color scheme of clothes I packed for the Horn of Africa. Two Euros fifty. And right now the dollar is darn near equal to the Euro. We went to Leader Prix on the way home to get envelopes for M and I snapped a photo of the pink sky. 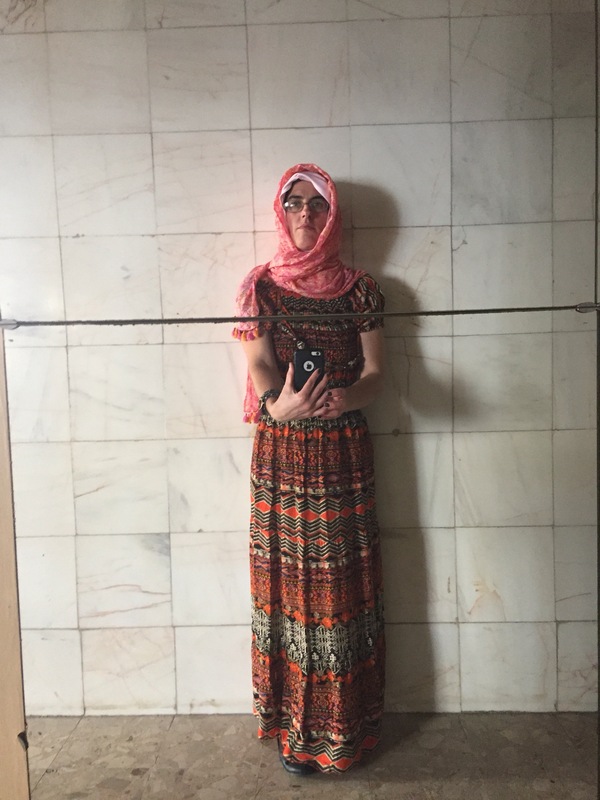 Before traveling to Djibouti and Yemen, I researched tying hijab via YouTube and did some practice as I hadn’t worn a hijab since my time in Tunisia two years earlier. On this trip, I wore a lot of different headscarves. I even cut off my hair to make surviving the heat easier (and to make it easier to fashion a hijab in the street if I needed to.) In Djibouti, most women wore colorful robes and scarves all of lightweight fabric. Some women wore Western attire, like the server in our coffeehouse who wore a short sleeved blouse and jeans. I didn’t intend on covering in Djibouti, but the heat soon changed my mind. I had packed four scarves: a full-sized pashima, a thin pink small neck scarf, a silk polka dot scarf very narrow and also meant for the neck, and a blue and gold Ethiopian textile. I quickly discovered that venturing outside without a scarf increased how hot I felt. The scarf also protected me from my own perspiration. So I wrapped a scarf around my head for my own comfort. 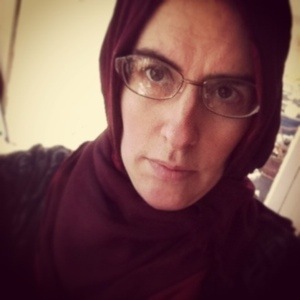 When we prepared for our journey to Yemen, I figured it was time to venture into hijab territory. 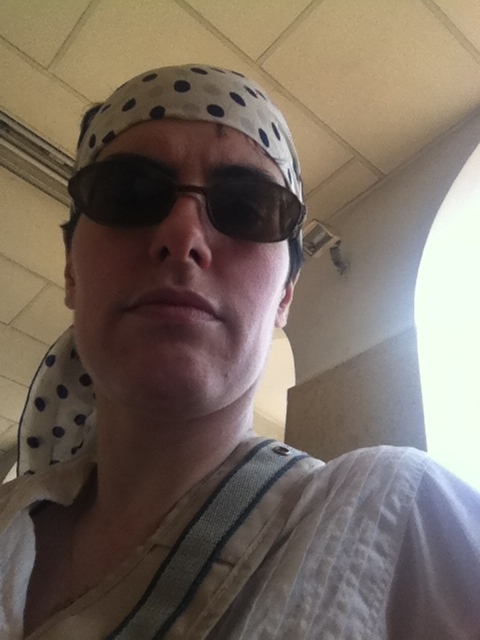 The weather in Djibouti is so hot that I opted to use my two small scarves to make a hijab (one on the front of my head hiding my hair, tied in the back, and the second across the back, tied in the front.) I draped the pashima scarf over my shoulders just in case I needed more coverage. The men at the reception desk complimented my look. 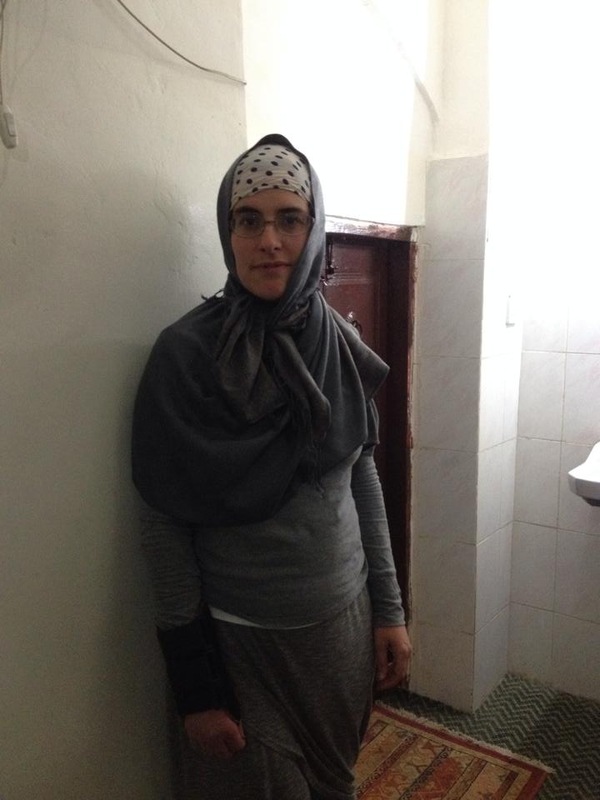 The next day in Yemen, I used the pashima more thoroughly with the pink scarf as my base hiding my hair. Our tour guide referred to my attempt as “respectful.” I used the pink scarf as the base to cover my hair. 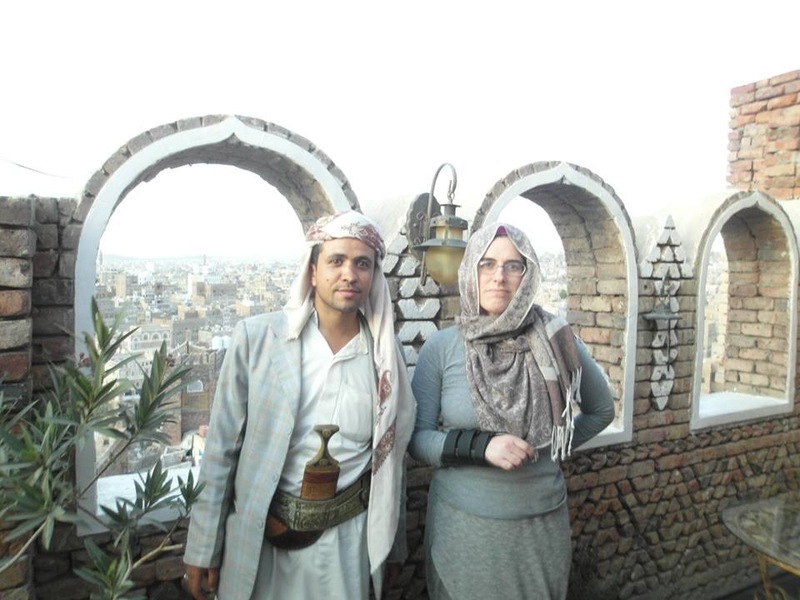 The photo of me with Mohammed on a rooftop in Sana’a was after I had to redrape my hijab after much walking. I don’t have any pins. Mohammed presented us with scarves during our visit to the suq. So before we left Yemen, I freshened up my look with my final hijab of my journey. 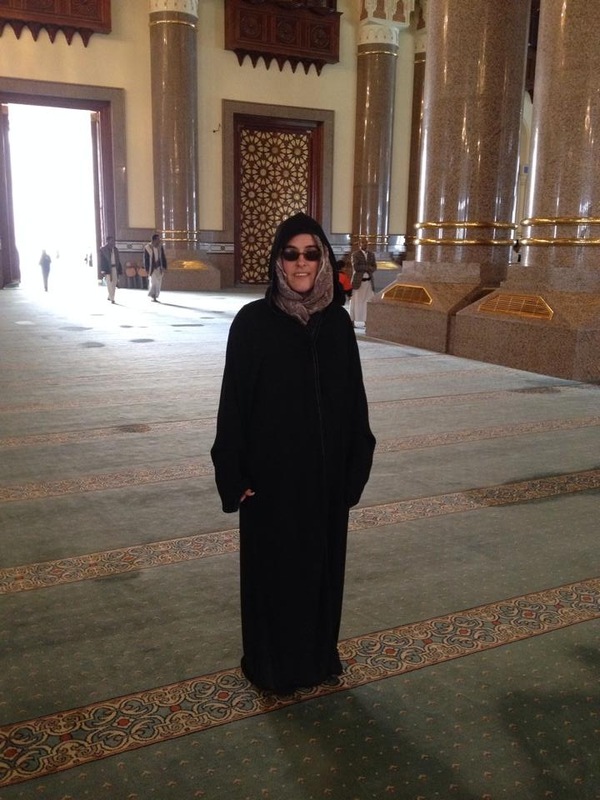 Of course, we also visited the mosque where I had the opportunity to dress in all black like most of the Yemeni women. 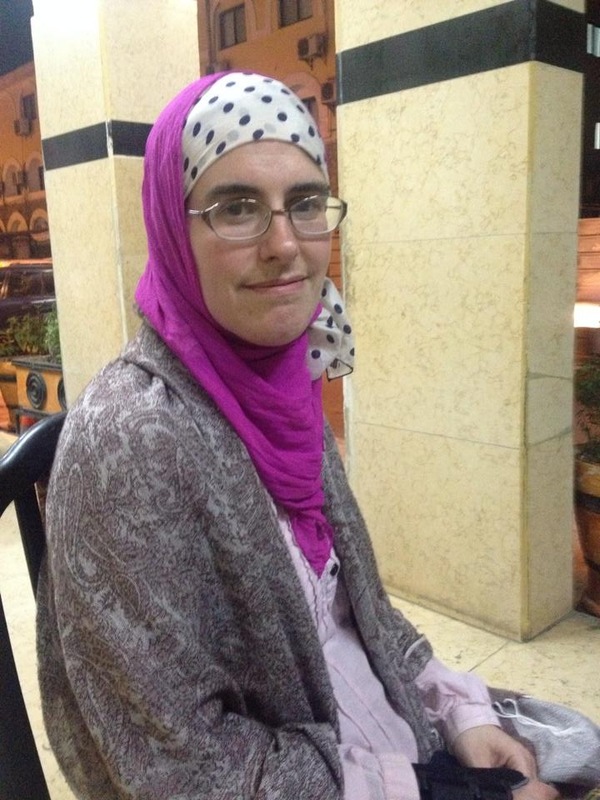 When I traveled to Tunisia in 2012, I learned to tie a hijab. I used this skill twice during my travels, once very successfully and the second, well, a tad dismally. I am renewing my hijab practice since I will certainly need to cover in Yemen. I struggled to use the same scarf that I did in Tunisia, but it kept looping over my face. I used a more narrow scarf in a jersey-like fabric and that became much easier to maneuver.